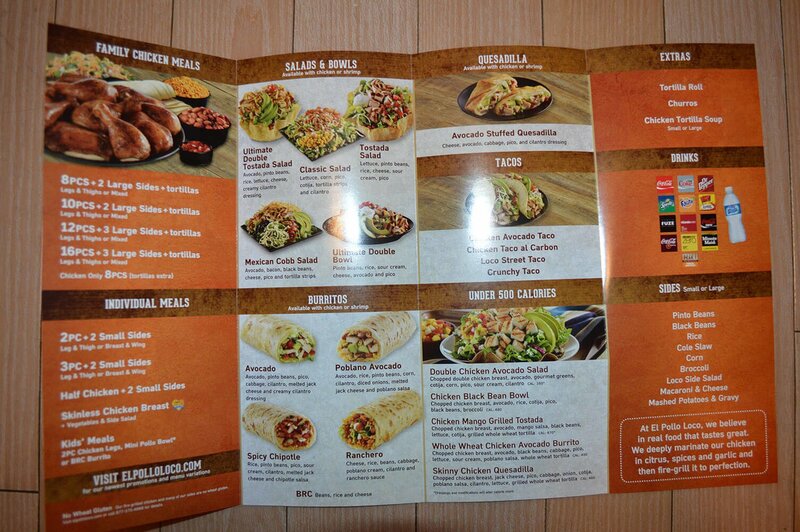 You have found the right place for the up to date menu with prices for El Pollo Loco®. With roots in Mexico, El Pollo Loco serves up flame grilled chicken and shrimp quickly for pick up or casual dining in. Some locations even have drive-through windows if you are in a hurry. Watch as the tender marinated chicken is grilled right before your eyes. Your mouth will be watering long before you even place your order from the delicious smells of chicken on the flame. Salsas, guacamole and dressings are all made in house from fresh ingredients. 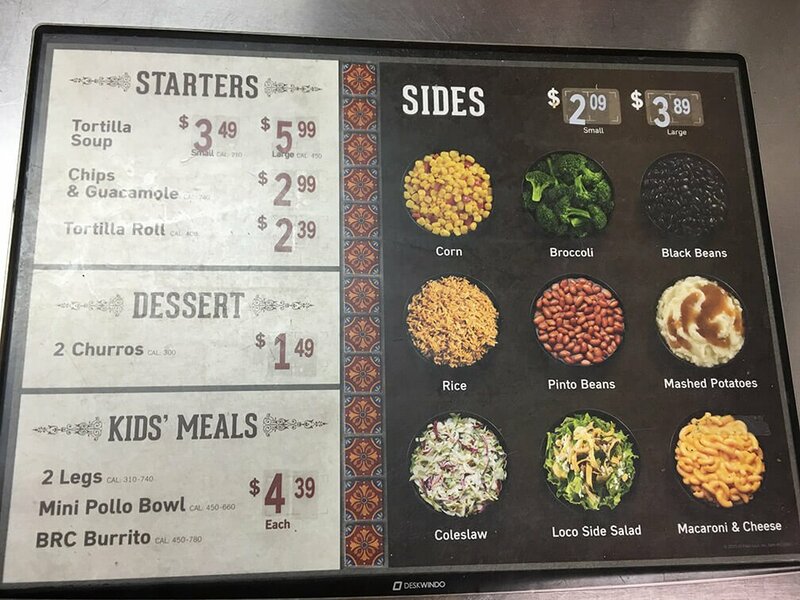 You won’t be having guacamole out of a can at El Pollo Loco! *Dressings and modifications will alter calorie count. Includes warm tortillas. cal. 170-410 per serving. 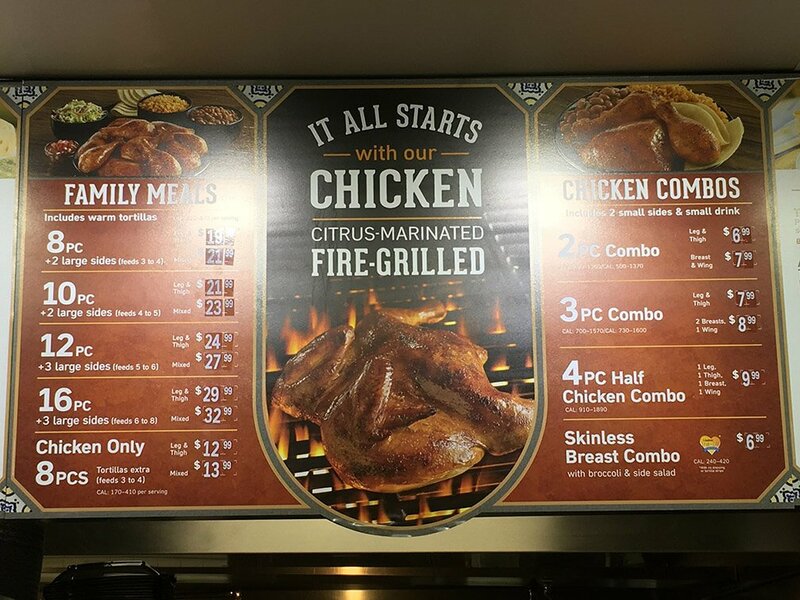 El Pollo Loco marinates their chicken in a house-made citrus and spice marinade before fire grilling it. Shrimp, cooked Baja style, is also available for substitution on most of the plates, salads and bowls. A salsa bar in each restaurant means you can pick the flavors you like best to pair with your meal. For customers looking for light and healthy fare, the menu offers 5 options in the Under 500 Calories menu, none of which compromise on flavor. The Whole Wheat Chicken Avocado Burrito has lots of protein with both chicken and beans, and plenty of bright taste with mango salsa and fresh avocado. This is a favorite dish on the Under 500 Calories menu. It features a double portion of chopped chicken with gourmet greens. It’s topped with corn, pico de gallo, sour cream, avocado and cilantro. Don’t forget to stop at the salsa station to customize the flavor to your taste. $6.79. This feast starts with heaping servings of Mexican rice and pinto beans topped with grilled chicken, corn, sour cream, cheese, fresh shredded cabbage, pico de gallo, and plenty of fresh sliced avocado. You won’t walk away from this meal hungry. 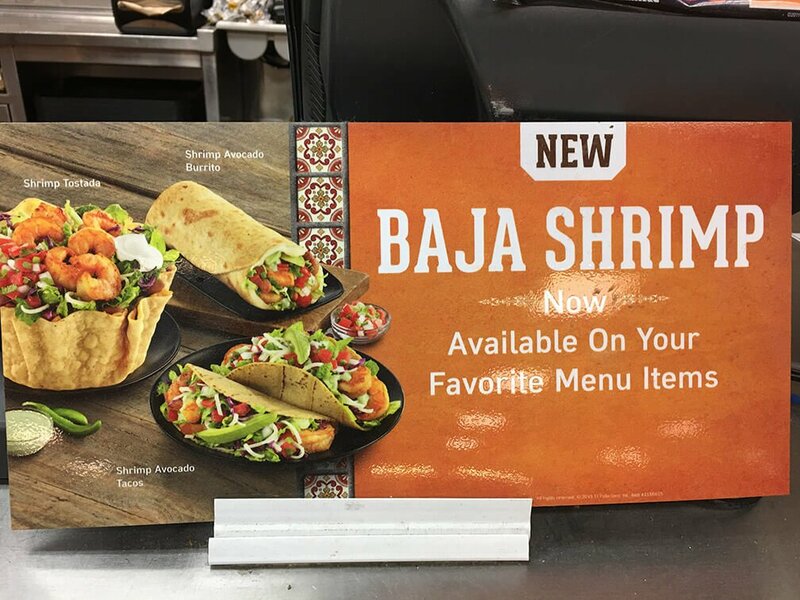 $6.49 with chicken, or have it with Baja shrimp for $7.49. If you need to feed a crowd in a hurry, this is a great option sure to please everyone. On top of 16 pieces of fresh citrus marinated and fire-grilled chicken, you get to choose 3 large sides. Warm tortillas and fresh salsa made in-house complete this meal for a large family. $29.99 for drumsticks and thighs or $32.99 for a mixed selection of white and dark meat. The roots of El Pollo Loco are actually in Mexico. The first restaurant was opened in 1975 by Juan Francisco Ochoa in Guasave, Sinaloa, Mexico. The first restaurant in the United States opened in 1980 after the chain had expanded to several locations in Northern Mexico. This Los Angeles location was so popular that it cleared $2 million in sales in the first year alone. The American El Pollo Loco restaurants were acquired by Denny’s in 1983. In 1999, with over 200 locations, the chain was sold to American Securities Capital Partners, and in 2005 it was sold again to Trimaran Capital Partners. The company moved to a franchise model in the mid-1980s and became publically traded on NASDAQ in 2014. 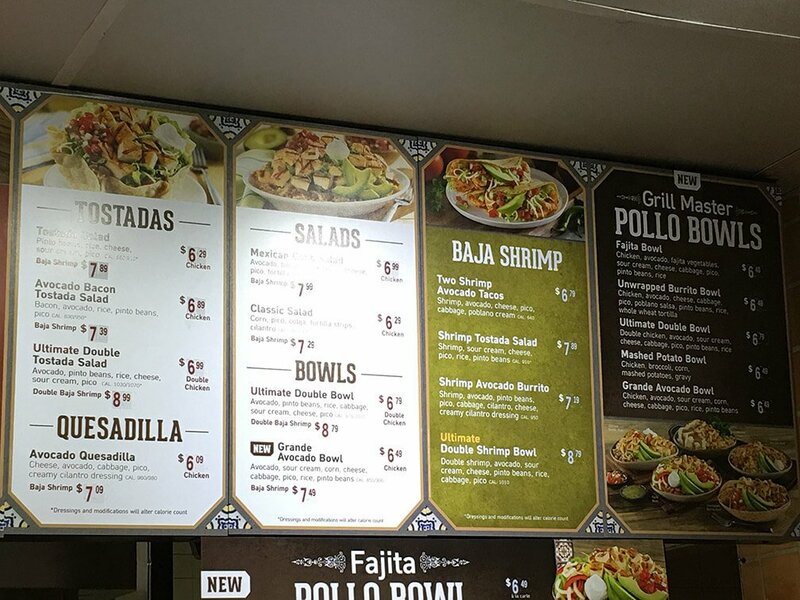 As of 2015, there are over 400 El Pollo Loco restaurants in operation throughout the United States. 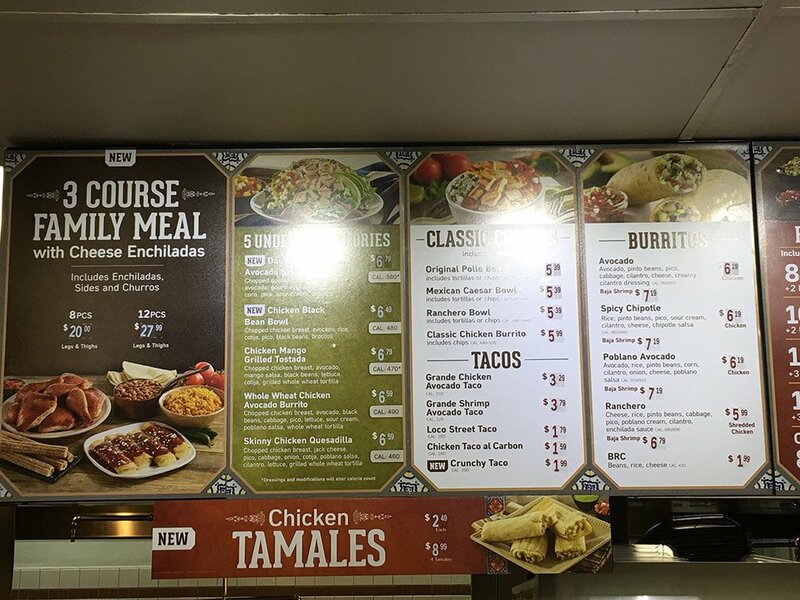 El Pollo Loco menu prices are subject to change without prior notice. Prices shown in images & the following table should be seen as estimates, and you should always check with your restaurant before ordering. 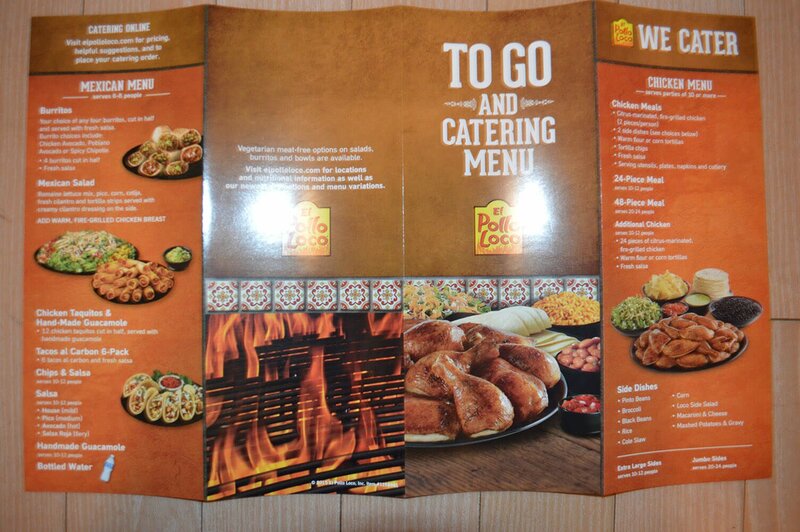 El Pollo Loco menu images sourced via e-mail from restaurant customer & menu-price.net user. menu-price.net does not guarantee the pricing or availability of any menu items listed in image or table format on this page. Pricing may vary from location to location.